A coalition of 10 Sunni Arab states is on a military offensive against Shiite Houthi militants in Yemen, recently proclaimed by America’s president as a brilliant example of war on terror, but now catapulting the Middle East into the inferno of battle. Saudi Arabia has initiated an international military operation in Yemen that many experts are already calling a proxy war against Iran, since Houthi fighters are believed to have strategic backup from Tehran. The internal Yemeni conflict has the potential to transform into a military standoff based on religious background between the Sunni monarchies of the Persian Gulf on one side and Shiites of the region supported by Iran on the other. 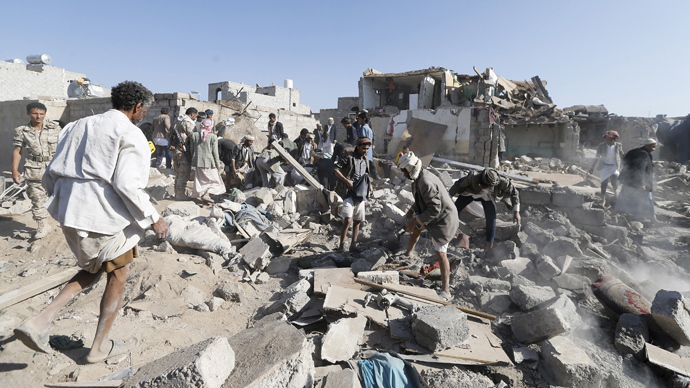 The coalition is bombing a country that used to have heavy American presence for years, since Washington used to station a fleet of assault UAVs in Yemen, waging drone warfare against militants of Al-Qaeda in the Arabian Peninsula (AQAP). “This strategy of taking out terrorists who threaten us, while supporting partners on the frontlines, is one that we have successfully pursued in Yemen and Somalia for years,” said Obama as recently as September 10, 2014. This longstanding fruitful cooperation between Sanaa and Washington has had a bitter ending, as Houthi fighters captured Yemen’s major cities and are offering a reward for US-backed President Abd-Rabbu Mansour Hadi, while the US were forced to evacuate its embassy from Yemen along with diplomatic missions of other western countries in early February. Yemen's territory has become increasingly fragmented, with Sunni militant groups operating in the south of the country and AQAP becoming active again. The base with deployed US killer drones remained operable until last week, when it was abandoned like all other US installations in the country. The developments in Yemen have drawn attention to Obama's policy of dealing with terrorism hot-beds around the world from Republican Senators John Mc Cain and Lindsey Graham. Yemen now in many ways resembles Libya, disintegrating after foreign intervention, or Syria, devastated by years of civil war, as fighter jets of the Saudi Arabia-led coalition are pouncing Yemeni military installations and infrastructure facilities. The meltdown in Yemen is causing embarrassment in Washington, editor of the Pan-African News Wire, Abayomi Azikiwe, told RT. “It is a very dangerous situation. What it represents is a total collapse of the US foreign policy in Yemen,” Azikiwe said, stressing that it was “clearly miscalculation” on the part of the Obama administration, which underestimated power of Houthi groups. “It is clearly a failure of the US foreign policy in Yemen,” he said. The US withdrawal from Yemen has revealed a massive property lost, as the US government is believed to have lost track of about $500 million worth of military aid provided to Yemen in recent years, beginning in 2007. Officials acknowledge that they’re unable to account for more than a million rounds of ammunition, 160 Humvees (HMMWV) vehicles, 200 M-4 assault rifles and 250 body armor suits – and this is far from being the full inventory of lost property. The US has no intention of stabilizing other nations, retired US Air Force Lieutenant Colonel Karen Kwiatkowski told RT. “What the US government is focused on is putting arms out there and creating bias for those arms. The US taxpayer subsidizes foreign weapon sales. So we’re always out there, our government is always out there looking for places to market our weapons,” Kwiatkowski said. US foreign policy is aimed at creating markets for the US weaponry and is good at it, not at solving crises, promoting good governments etc. “That’s not our expertise. We don’t spend time and money on that. We spend time and money on creating consumers for our weapons,” she said. Meantime Saudi Arabia, Egypt, Jordan, Sudan, Pakistan, Morocco, Kuwait, the United Arab Emirates, Qatar and Bahrain are bombing Yemeni territory using mostly US-made weapons and hardware, with a proclaimed objective to prevent President Hadi from losing power. “We will do whatever it takes in order to protect the legitimate government of Yemen from falling,” Saudi Arabia's ambassador in Washington, Adel al-Jubeir, told a news conference while announcing the operation. After the Iran’s advances in Iraq – which borders Saudi Arabia to the north – the kingdom is worried that Yemen, on its southern frontier, is going to become a proxy for Iran as well. “In the absence of the Americans, who have temporarily quit the field, the Saudi’s will think they have no choice but to go in pretty hard. We are going to see redesign of the region,” President of the Australia Institute of International Affairs John McCarthy told Reuters. The key to the unwinding military conflict is going to be reaction of Iran, which has its finger in many ongoing conflicts in the Middle East. If Tehran decides to play big, oil exports from the region - crucial to the world economy - could fall victim to the regional conflict. That in turn will threaten energy supplies of many countries, particularly China, Japan and South Korea.